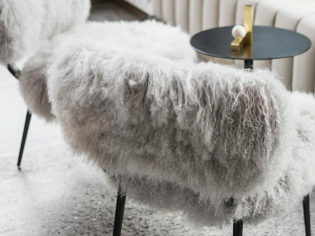 Some of the furniture is so fluffy you could almost mistake it for a furry friend. Can a hotel built in a matter of weeks on the cusp of Perth’s Kings Park tick the right boxes? Fleur Bainger checks in to Tribe. Having your hotel made in China isn’t usually something to crow about. But Tribe Perth is rather proud of the fact it was constructed in only two weeks, something made possible by its pre-fabricated, modular rooms that are stacked up like Lego. Tribe’s unconventional style can be put down too it being built in less than a month. Not that you’d know. The eight-storey building that opened in May in West Perth’s corporate zone blends in effortlessly, with its jet black, shiny cube-shaped glass exterior. And then you saunter inside to find a designer wonderland with a modern luxe vibe. Neon lights reflect in black columns as shiny as patent leather; chairs fluffier than a poodle sit beside a giant chesterfield in emerald velvet; spray paint splashes plush lobby stools and multi-directional director’s lights illuminate the airy entry space. I feel cool by association. So do the front desk staff, I’d wager. All three say hello without lifting their eyes from their screens. Tribe calls itself a tech savvy destination but this wasn’t what I had in mind. More accommodating is the wi-fi: there’s no password required. At the Tribe the menu is courtesy of celebrity chef Tobie Puttock. I beam up to the sixth floor in a mirrored lift and gasp as I enter my black, grey and white room. It’s compact. But clever, too: a felt bed base has cut-outs for bags and shoes; there are USB points in the walls, a flat screen TV (to which you can connect a music-playing Bluetooth device, but alas, only if it’s a Samsung), a mini fridge absent of mini bar and a pod bathroom with Kevin Murphy products. A huge singular window with blackout blinds that reveals my Kings Park view, costing extra, is dominated by an ugly office building. At checkout I’m advised the hotel is reviewing its view classings. I regard Tribe’s other niggles as similar teething issues: my bed is stripped while I’m at breakfast, despite a ‘quiet’ sign on the door and a 12 noon checkout, and a $25 parking fee is charged without warning (they waive it). Tribe is located on the cusp of Kings park just outside the CBD. Dinner (menu courtesy of celebrity chef Tobie Puttock) surpasses expectations via a tasty mixed grain salad and lamb shanks. In keeping with Tribe’s unconventional style, it can be had in the communal space or brought up to my firm, comfy bed. A burger and a drink, what more could you ask for after a day of traveling. And that’s what makes this hotel stand out as a somewhat discerning, young-at-heart offering that business travellers will love. Privately owned but managed by Mantra Group, it sticks to some rules but breaks just as many others. A common area that looks more like a night club. 4 Walker Avenue, West Perth. Verdict: Hip design hotel with plenty of personality in a corporate location near the city centre. The 126 compact rooms are ideal for the overnight business traveller. Sit back, relax and have a cocktail while staying at the Tribe. We rated: The fun, un-hotel feel and the colourful, mismatched yet glam furnishings, pop culture books and buzzing beats, all in the lounge-lobby. Unconventional yet interesting design. Tribe, Perth. We’d change: You’ll only score a park view on the top floor; next time we’d opt for the urban side and aim to roost in the upper echelons. Notes: We paid $199 for a ‘park view’ room on level 6, which included breakfast, espresso, wi-fi and in-house movies. Parking is $25 and must be requested in advance.